Responding to an increase in violent incidents in Xinjiang and elsewhere in China, authorities launched a nationwide crackdown on terrorism in May of 2014. The campaign, which has focused mostly on Xinjiang, has steadily escalated over the past two years, and controversial policies targeting the rights of the predominantly Muslim Uyghur minority have been criticized by international rights advocates for exacerbating ethnic tensions in the troubled region. 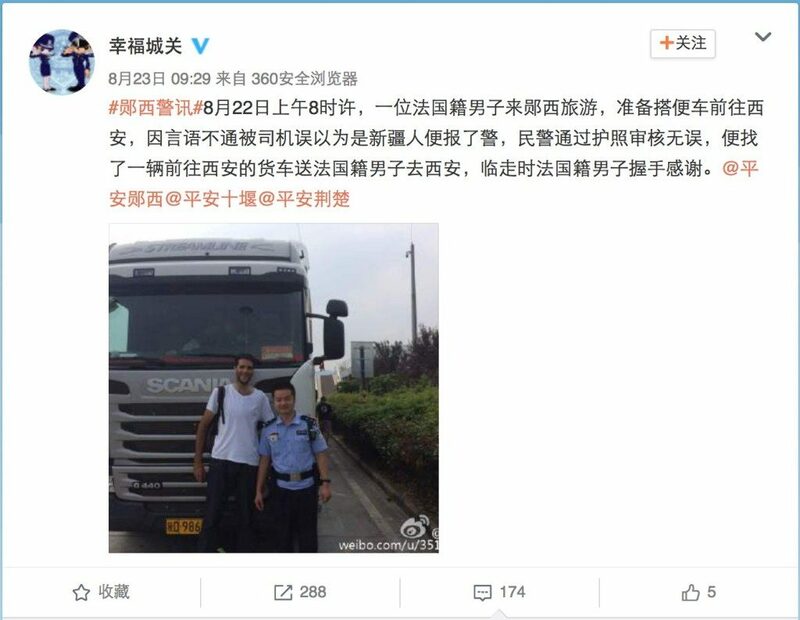 Some such policies have been aimed at restricting and monitoring the mobility of Xinjiang residents, presumably in relation toauthorities’ concerns that some Uyghurs are traveling to the Middle East for jihad training. In May of 2015 all residents in Xinjiang’s ethnically-diverse Ili Prefecture were ordered to turn their passports in to public security authorities, and earlier this year, it was reported that all Xinjiang passport applicants would be required to provide DNA and other biometric data with their applications. Ping’anShihezi (@平安石河子)：#关于实行护照年审的紧急通知##EmergencyNoticeOnAnnualPassportInspection: On the request of higher authorities, please take your passports to the hukou site at your local police station or the ShiheziPublic Security Bureau’s Entry and Exit Administration Department for an annual inspection. After the inspection, all applicants’ valid passports will remain in official custody for safekeeping. If a resident does not comply, they will assume responsibility for their being forbidden from leaving the country. From now on all passport applicants please first go to the hukou site of your local police station with your biometric data, then proceed to the Immigration Bureau to collect an application form. Applicants need to obtain approval letters and stamps from your neighborhood committees. Those who are currently employed must also obtain approval stamps from employers’ administration or HR department. All other passport application procedures will remain unchanged. […] An employee who answered the phone at the Shihezi police department entry and exit bureau on Thursday confirmed the new rules, saying they are currently being rolled out across the Xinjiang Uyghur Autonomous Region. “The official deadline for passports to be handed in … is Feb. 16, 2017,” the employee said. […] A resident of Shihezi told RFA on Thursday that the new rules had made life far less convenient for local people. “I’m a little reluctant to hand in my passport, because now I’ll have to get it back off the police if I want to leave the country,” the resident said. […] Ilshat Hasan, president of Uyghur American Association, told RFA the passport policy signaled a harsh approach to Uyghur communities. 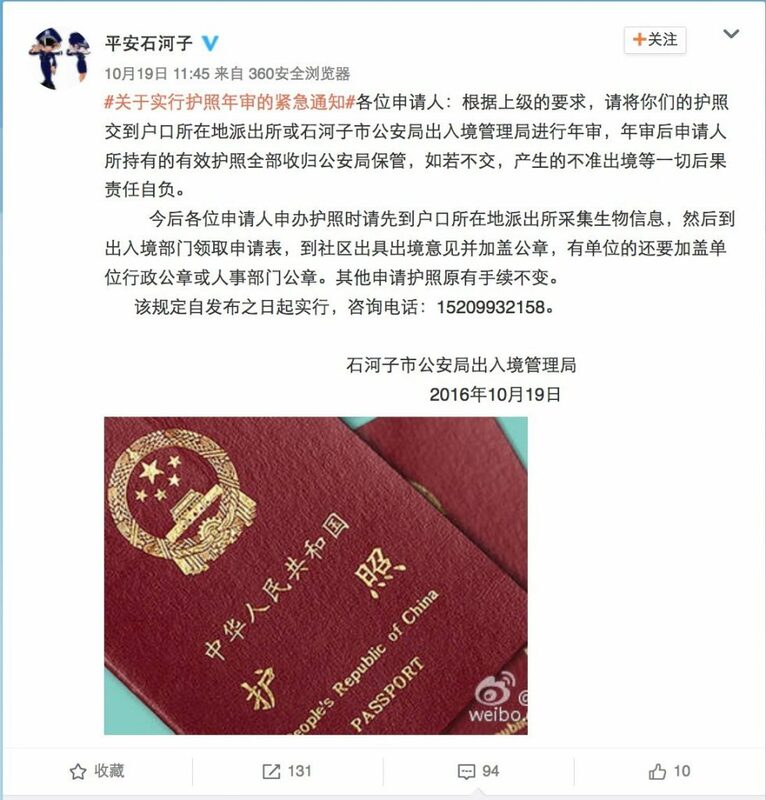 Some netizens agreed that this policy could be excessive and counterproductive.NiXianshengDeWeibo (@尼先生的微博) commented, “ID cards should also be collected for annual inspection. Each time someone wants to leave their house they have to obtain an approval stamp, then head to the police station to retrieve their card, only then can they go out. So convenient! Forwarding the spirit of efficiency in Xinjiang.” This post has since been deleted.